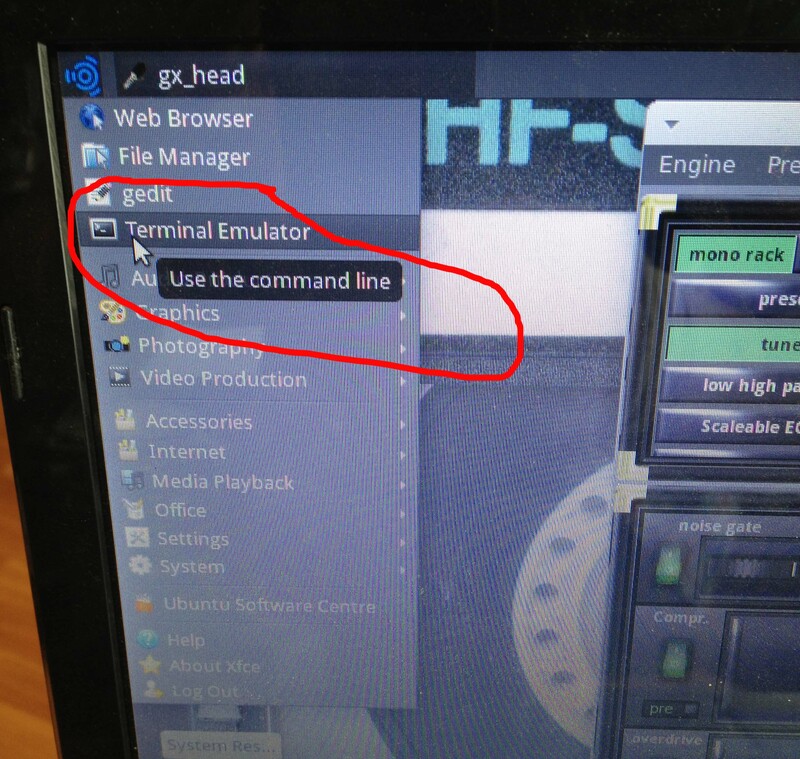 This post deals with setting up Guitarix on a laptop. Unfortunately inspiration can hit at the most awkward of times. Working as a guitar teacher I often work funny hours so if I need to get something down late at night or right before a lesson I need to be able to record direct into my interface. Night time is obviously a problem because of noise levels. During the day not such a problem but students entering my office/studio will usually end up having to navigate microphone stands. In a smaller space this can be a bit awkward. The solution that came to mind would obviously be to use some kind of plugin like IK Multimedias Amplitube or Native Instruments Guitar Rig. The problem I found with this is that with my computer and interface I was experiencing a bit of latency when monitoring. Now I know I could record my guitar signal dry and apply effects afterwards but this never feels right to me. Guitar effects have a way of making me play differently. So the solution seemed to me to be to turn my laptop into guitar effects/amp modeller and record from my Lexicon Alpha into my Focusrite but alas even with just amplitube running on its own I was still experiencing latency and every time I tried to drop the latency down to a better setting my laptop was crashing. Traipsing the internet for a solution I came across Guitarix and Ubuntu Studio – the article claimed that Ubuntu could get excellent latency for guitar fx. 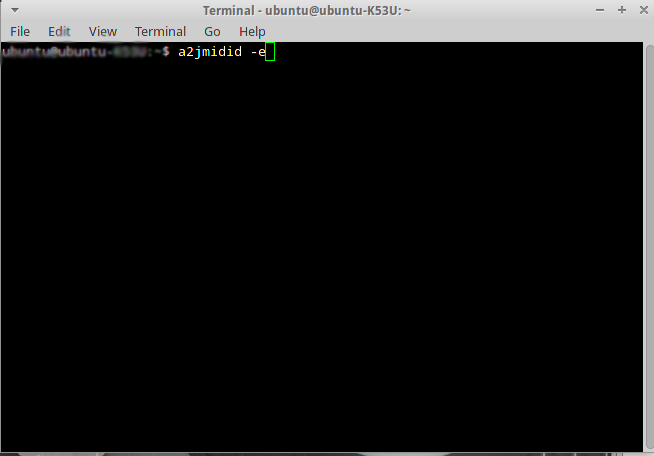 ***Note*** you’ll need to download Ubuntu Studio and follow the instructions in the article above – if you’re not sure what you are doing quit now unless you are prepared for some things going wrong. Backup everything on your laptop. I take no responsibility for things going arse end up. 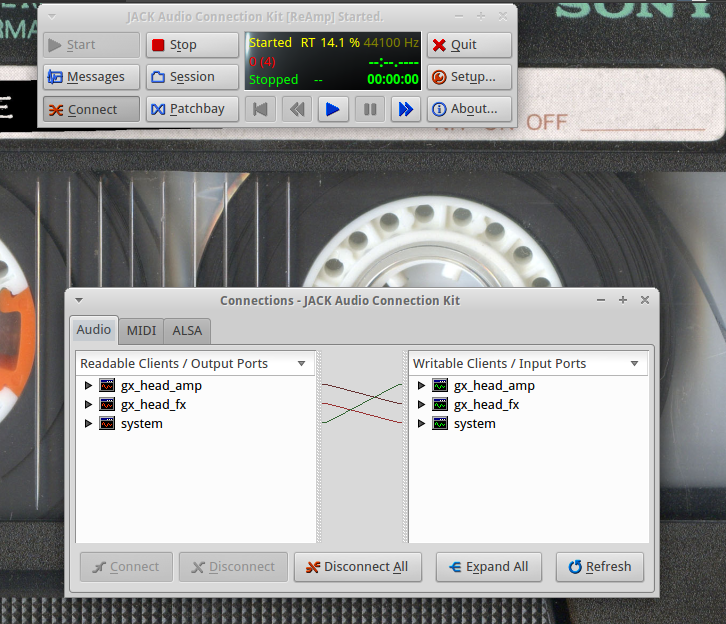 The audio device I decided to use was a Lexicon Alpha USB audio interface that cost me £50 from amazon. Beware this device has no midi and is from what I can see not supported by Ubuntu. That said I currrently have it working in my setup. I also have an x-session evolution midi controller – again from documentation this doesn’t seem to be supported but it is currently working in my system. 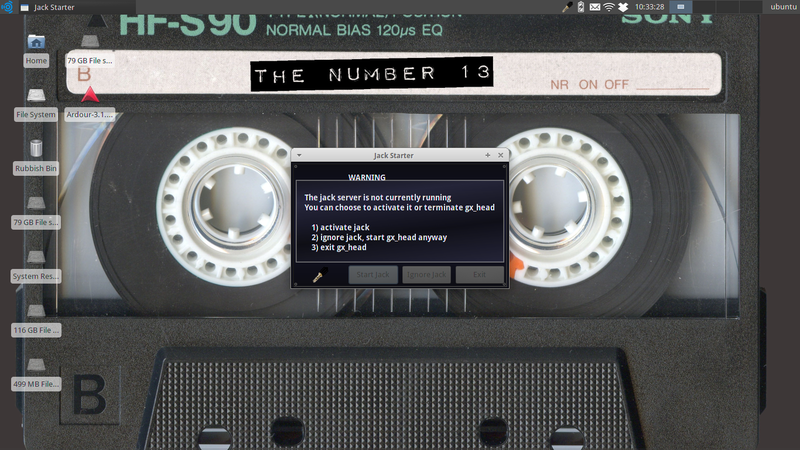 The first problem I found was that when I started Jack I was getting a ‘D-Sub’ error – I fixed this by uninstalling Pulseaudio – for some reason it seemed to be causing a conflict – I’ve since experienced the same problem which seems to be fixed by running Ardour first? Either way I can get it running. 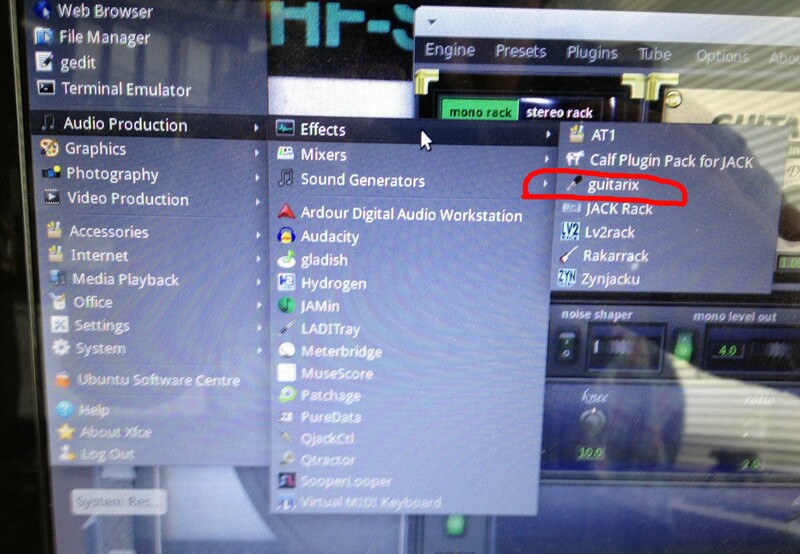 If you have this problem try starting ardour first then try uninstalling Pulseaudio. 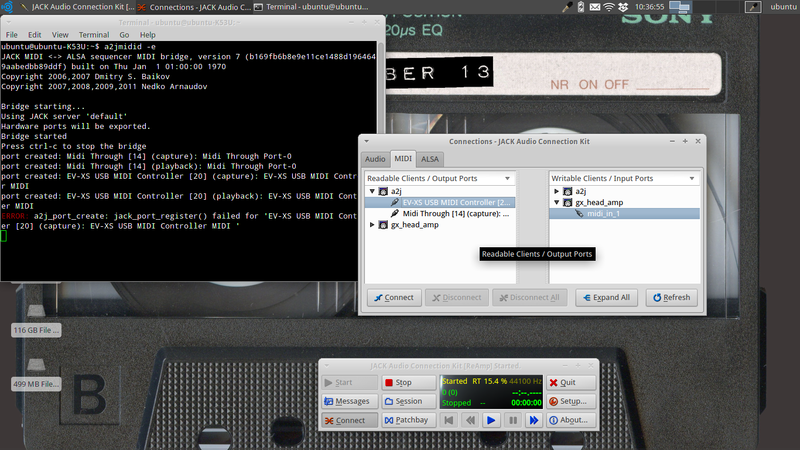 Once Jack has started and everything goes ok you should see this in Qjackctl. Plug in your guitar and give it a bash. 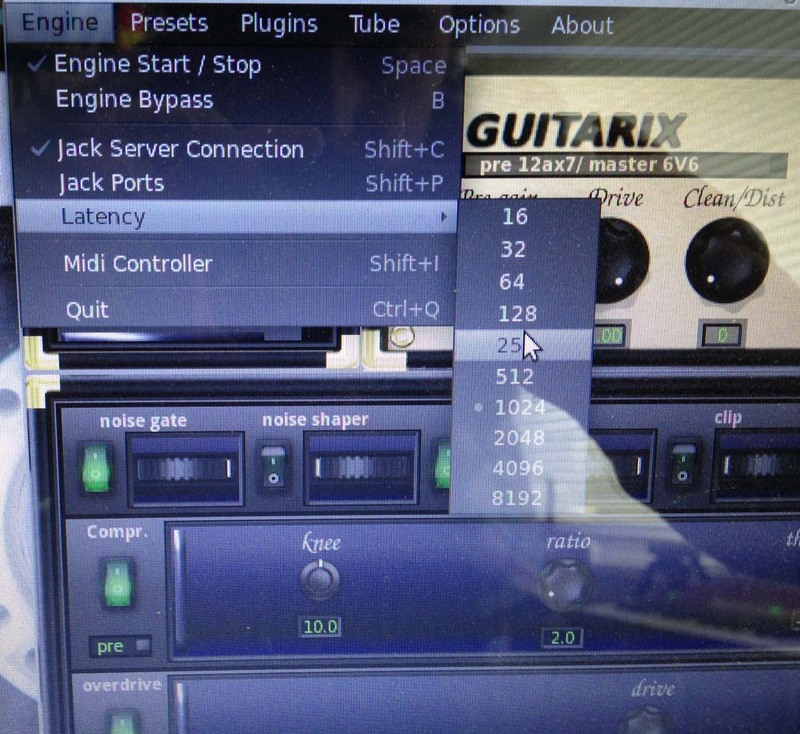 To set up latency – go to the Engine Menu in Guitarix – I use 256 although I’ve had it at 128 – 256 seems to more stable and far better than I’ve achieved in Windows. What I will say is that I really like Guitarix – it’s simple to use and as with anything if you have a good mess around with it you can get some pretty good sounds. 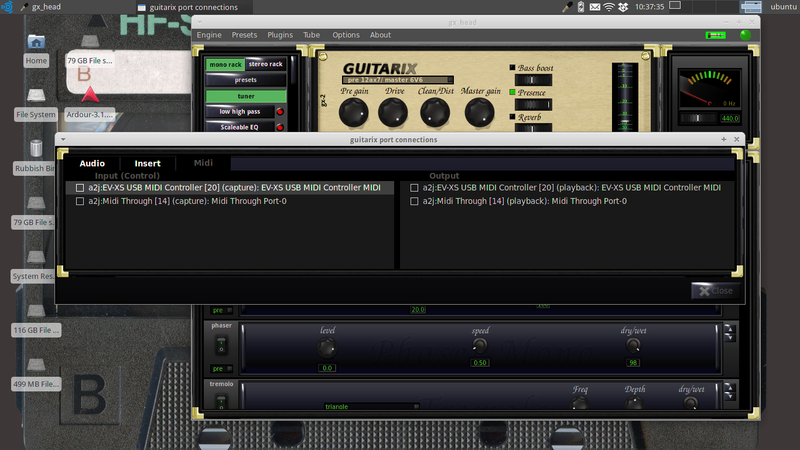 So my next step was to set up Guitarix with a midi controller I had knocking around. This proved to a bit trickier and took some reading. 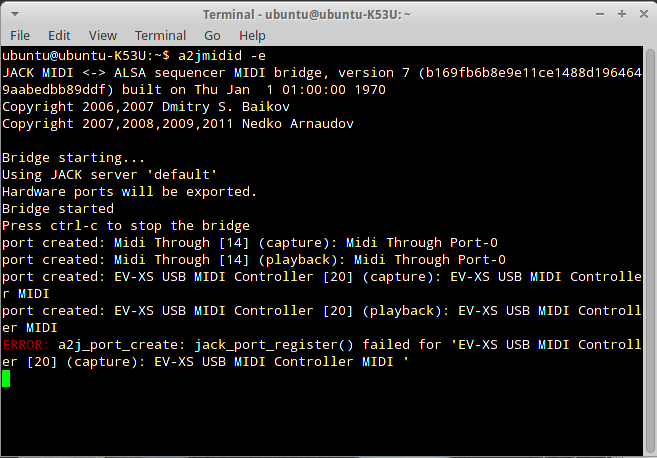 Basically I found out that I needed to use something called ‘a2jmidid’ to create a port for my midi device. I seem to get the one error but it still works – not sure what this is – I have on occasion had errors for all ports and this seems to be an issue with which usb port I use – I haven’t figured out why – also when I plugged in my mouse that seemed to break it as well, swapping USB port fixed that problem. I’m guessing that there are going to be errors of different systems that have different solutions, which probably doesn’t help anyone. Hopefully some of what I’m doing and the solutions I have found will help. Put a tick next to your device and you will now be connected. 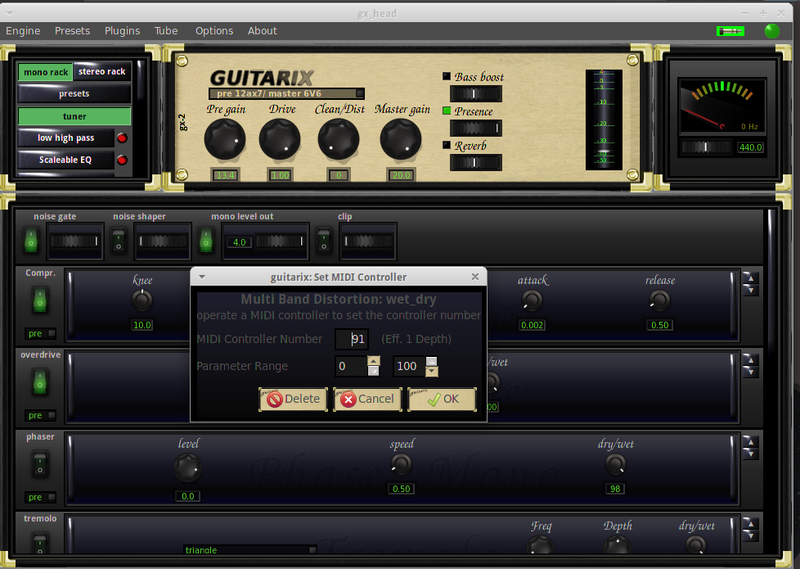 With your Midi Controller now setup you can start to edit Guitarix controls to your taste. To edit midi control you need to hover over control – ie the GUI pot – either middle click on your mouse or double-click on laptop mouse pad to open parameter screen. Now wiggle a Knob on your midi controller and it should now be mapped to that control. It;s the same as any midi control mapping – try and plan what you want to control. I have used an X-Session Evolution controller – it’s old but works perfectly – it gives me desktop control of guitarix which is far easier to use that trying to control using the mouse. Here is a picture of my controller – I’ve made really scruffy labels to show me which controller works which effect parameter. I’ve mapped it across two banks – with the x-session banks are ‘recalled’ by pressing the recall button and then the bank number button. Recall + 2 gives me control of Cabinets, Tremelo and Phaser Effects. I’ve also mapped the buttons to turn effects on and off. If you’ve never used midi control all this will be confusing as hell to you so you’ll need to look at that in more depth elsewhere – if you already know how to map using midi learn then hopefully some of this will make some sense. It seems that I can’t save any of my presets – not sure why and as much as I’ve looked I can’t find a solution. So it’s off to the Guitarix forum to see if I can get any help on that matter. As soon as I have an answer I’ll edit this post to add the solution. I hope this post helps someone – it’s probably confusing as hell and I’ll read through it to make sure it reads better. In the meantime it’s here for myself just in case I have to set this up again.